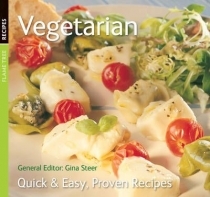 Vegetarian food does not have to be boring, consisting entirely of slight variations on the same ingredients night after night. This great new cookbook is packed with tasty and imaginative dishes for anyone who doesn't eat meat or animal products, whether through conscience, taste or intolerance, or simply those who love their veg as much as their meat. With 145 delicious recipes grouped into sections including Soups & Stews, Pastas, Rice Dishes and many more, some are innovative, some are classic, but all of them will have you reaching for a second helping. There are also sections on nutrition and tips on how to cook staple foods. So, from the light Mediterranean Rice Salad to the hearty Mushroom Stew or Cheese & Onion Oat Pie, there is a recipe to fulfil every craving!